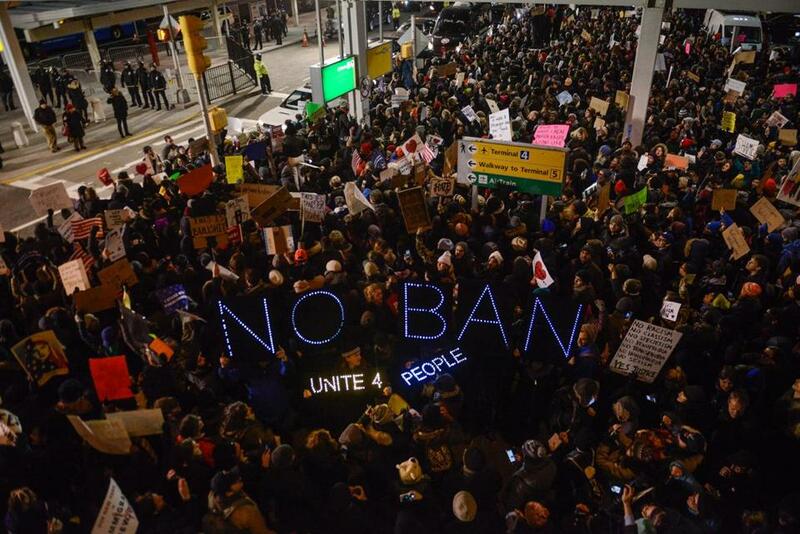 Protestors demonstrated at John F. Kennedy International Airport in January against President Trump’s executive order halting refugees and residents from predominantly Muslim countries from entering the United States. The number of international tourists visiting the United States dropped by nearly 4 percent in the first six months of 2017 over the same period last year, according to data released by the US National Travel and Tourism Office and the US Department of Commerce this week. The drop coincides with President Trump’s low international approval ratings. The 3.9 percent decline is steeper than anticipated. Perhaps the most troubling part of the new Department of Commerce data is that much of the decline in international arrivals comes from countries that are vital for US tourism. The decline includes a 5.7 percent reduction in overseas arrivals, and a decrease of 9.4 percent from Mexico. The biggest drop came from the Middle East, which has been the target of Trump’s travel bans. Arrivals from the United Kingdom, the largest overseas market for the United States, dropped 6.2 percent year-over-year from January through June. Tourism from China, which was seen as a lucrative, burgeoning market for the United States, dropped 3.2 percent for the first six months of 2017. The sharpest decline in Chinese visitors came in June, when the United States saw 10.6 percent fewer Chinese tourists than in June of 2016. The one bright spot in the Department of Commerce study was news that the number of travelers from Canada increased 5 percent over the same period last year. While the percentages look small, they account for billions of dollars lost from the US economy. According to the group Tourism Economics, the United States lost $2.7 billion in tourist spending during the first three months of 2017 over the same period last year.